Alongside our weekly in-gallery curator “One on One” talks, we post regular ‘one on one’ bits from curators, staff, and public, on a particular work or exhibition they’re interested in. Follow the series here. Today’s post is from curator of painting and sculpture Janet Bishop. On the 2nd floor right now we have a gallery devoted to the work of Sherrie Levine. The centerpiece is a sculpture titled La Fortune (After Man Ray), which three-dimensionalizes a billiard table that appears in a 1938 painting by the photographer Man Ray, called La Fortune. Levine’s piece was first shown in 1991 at SFMOMA as one of six identical tables, presented serially and in precise alignment à la Donald Judd. As with much of her work, there is an element of the uncanny. The balls are secured in place and the cue sticks are absent; there is no mechanism built into the sculpture for the game to be actually played. 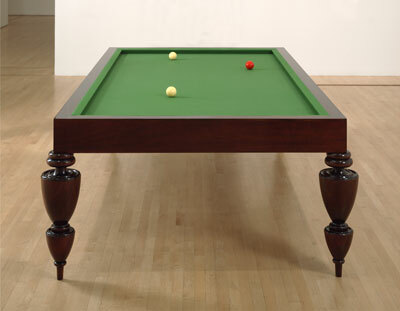 La Fortune (After Man Ray) is, ultimately, no more a billiard table than its painted source, both made in the spirit of René Magritte’s famous painting The Treachery of Images (This Is Not a Pipe), from 1929. The Magritte painting pictures a pipe accompanied by the words Ceci n’est pas une pipe—a seemingly contradictory but literally truthful statement that it is not a pipe we are seeing. Using a wide range of media, Levine explicitly appropriates works from the male-dominated Western artistic canon, resulting in a practice that is part commentary on a wildly unbalanced history and part homage to artists who, gender aside, have inspired her. Levine’s visual thievery began in the early 1980s when she started taking black-and-white photographs of reproductions of photographs. Among these were her After Walker Evans pieces (1981), also on view, which are next to impossible to distinguish from the real thing. Levine’s rigorously conceptual and coolly aesthetic practice calls into question issues of authenticity, originality, and fair use. While her photographs most audaciously beg the question of how closely a work of art can approach another and still be a work of art, all of her creations extend the aura of their referents as they generate their own. Levine thus claims history as part of her history, insisting that the male artists she admires share the stage. Join me on June 4 to look closely at this concentration of works by the artist and discuss the issues they raise.